Sywell Aerodrome advertises its ‘superb airfield facilities and a wonderful art deco styled hotel’ but even the word ‘aerodrome’ reeks of the 1930s with its images of flat roofs, stainless steel and curved Crittall windows. Allow your imagination free rein and you can see bright young pilots with leather helmets and goggles, pipe clenched firmly between teeth, donning sheepskin jackets before setting off in their biplanes for lunch at Le Touquet. Ladies certainly knew how to dress in the 1930s. 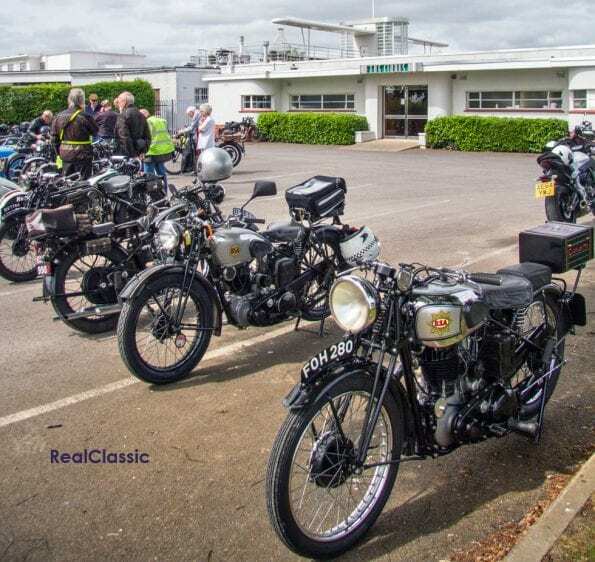 Moving forward to the real world of the 21st century, Sywell’s car park played host to the start of Northampton VMCC’s Girder Fork Run where bright, young(ish) pilots assembled with their mounts. 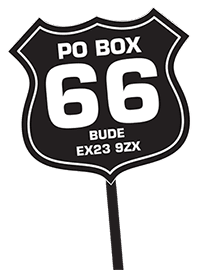 The only things missing were pipes and lady riders, otherwise it could have been 1937 all over again as girder fork machines outnumbered those with new-fangled telescopic appurtenances. 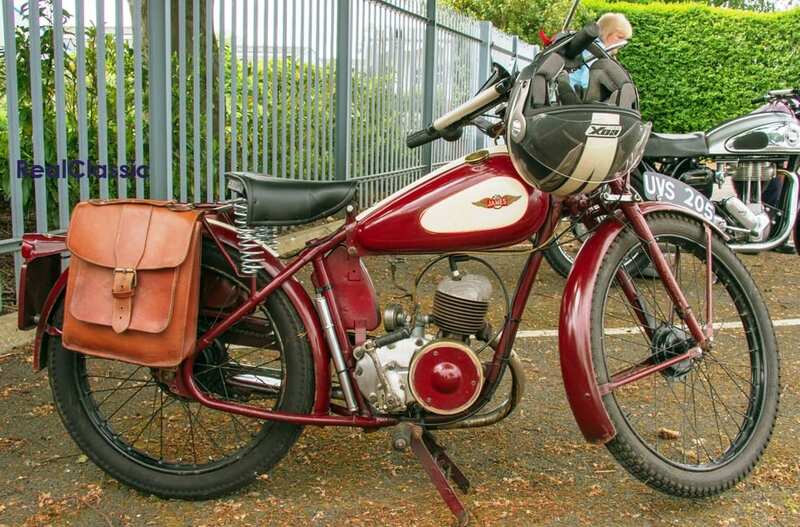 Let’s start with what I think was the smallest capacity machine on show, a 1949 James with its 98cc Villiers two-stroke engine perhaps looking a little overpowered by its girder fork brethren. Harry William James started the eponymous company in 1880 to build penny farthing bicycles. His first primitive motorcycles, with Minerva engines, didn’t appear until 1902. 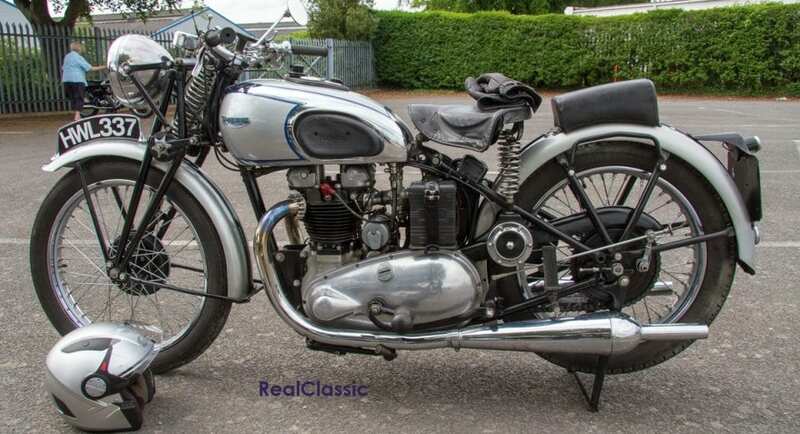 By the time we get to this one, all engines were made by Villiers and the marque had moved to the small, lightweight motorcycle market segment which this Comet epitomises. The following year telescopic forks were adopted and James was sold to AMC in 1952. 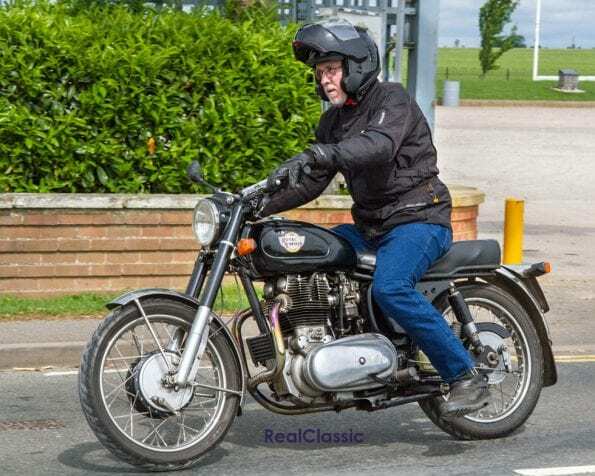 Let’s have a look at a BSA B2 – as you can see from the before and after photographs it has undergone a serious amount of restoration by owner, TrevorP. Trevor is an experienced and talented engineer who seems to have inordinate amounts of patience when it comes to restoring and riding his machines. 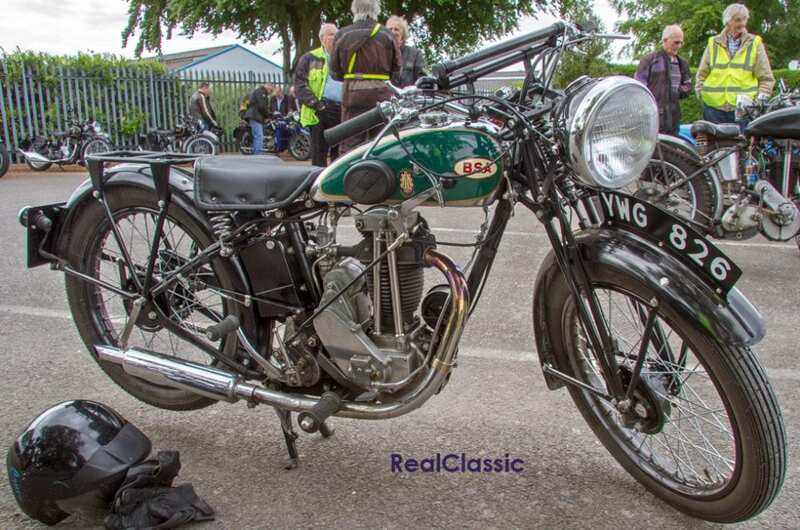 The B2 dates from 1936, the last year of a run which started in 1933 for this ohv 249cc single which had total loss lubrication. 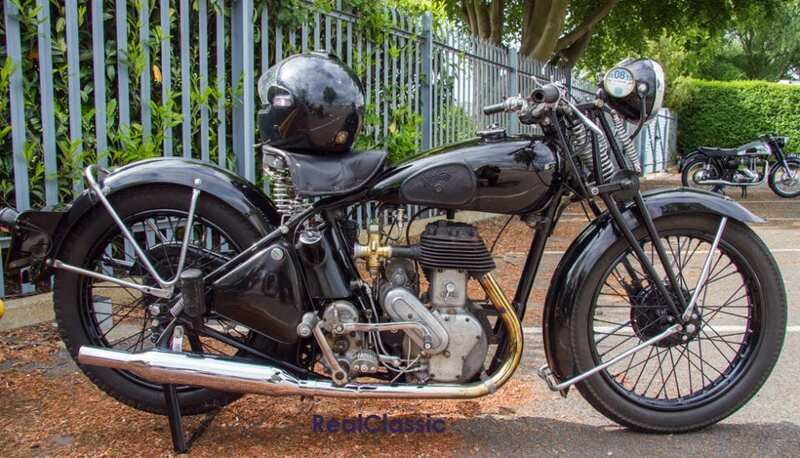 Back in the day it was marketed as a dependable and competitively priced motorcycle for the masses; now it has a charm that makes it a very pleasant pre-war classic, assuming you can get on with a hand change gearbox. This was the B2’s inaugural run and when asked how it was going Trevor replied ‘interesting…’ so perhaps some minor tweaking is yet required. 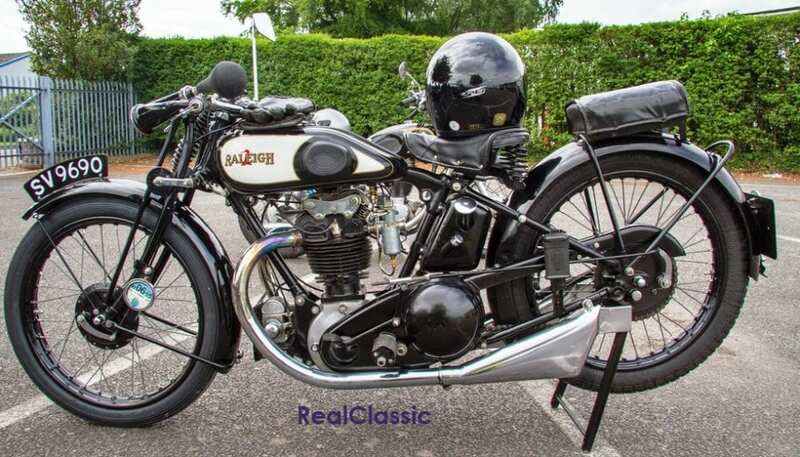 This 1928 Raleigh really looked the part; it’s one of those motorcycles that seems to dominate the space – and machines – around it. I believe that it’s the ohv single introduced by the marque in the 1920s with a Sturmey Archer gearbox and Amal carburettor but its overall appeal is in the appearance. It’s amazing to think that a relatively short time later the company that manufactured this machine was better known for its mopeds and bicycles. This rugged-looking Levis is a 346cc ohv four-stroke from 1937, although I think it’s fair to say that the oil tank and the exhaust system are more modern additions. At around this time Levis built a two-stroke 250, a twin-port pushrod 250, a choice of ohv 350s with single exhaust or twin-port and pipes, a similar arrangement at 500cc and a twin-port 600. The SP 350 model featured positive stop foot change with a neutral indicator, five-plate clutch, 6V Miller electrics and seven-inch drum brakes. It weighed just 310lb; the saddle could be adjusted down to 27 inches and the purchase price of £62/10s included full electrical equipment – and even an illuminated speedo! Given the crowd it attracted, the Pegasus may have been the machine of the day. Its owner (of four months’ standing) told me that it was a 1928 P&M frame housing a 747cc Austin 7 engine from the previous year. A friend of his had found it in a sorry state and then restored it before selling it on. 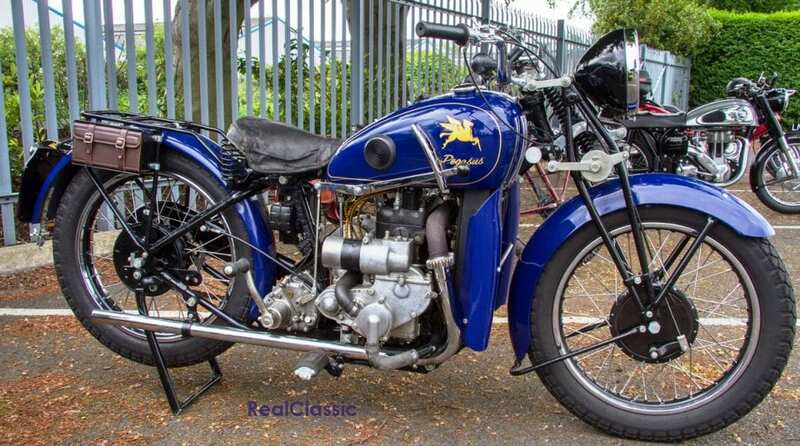 Rarely mentioned in any reference books, it appears that the Pegasus was the work of a Mr McColkin who worked for Douglas Motorcycles in Bristol and built six of these specials. The owner told me his main passion was classic cars but he had a yen for motorcycles too – this seems to be a very happy compromise. 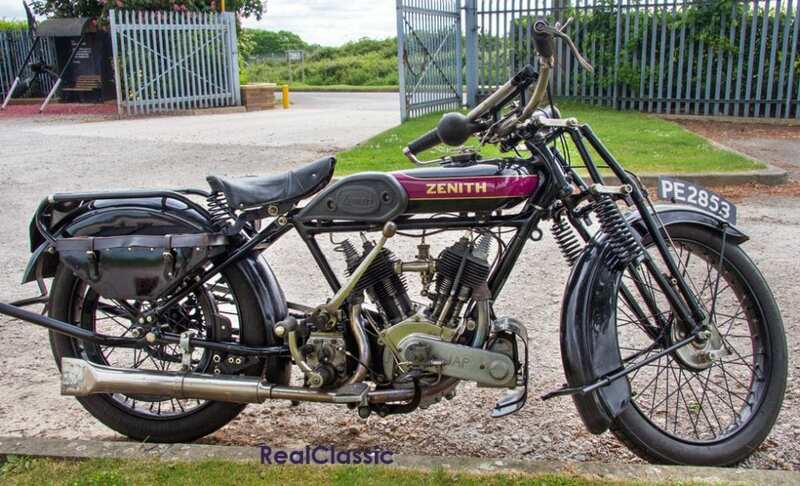 In the 1920s, Zenith of Finsbury Park in London used JAP engines in their stylish motorcycles, ranging in capacity from 250cc to 1100cc. 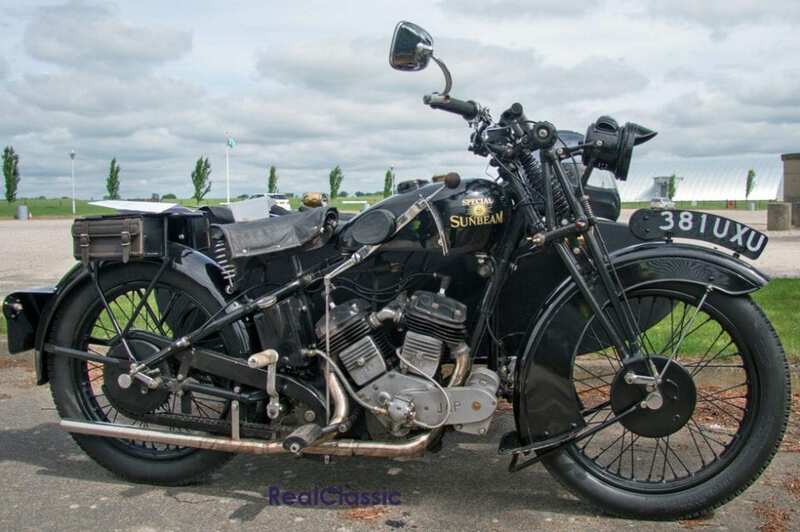 This attractive 1925 example falls somewhere towards the middle with its V-twin’s 70mm x 88mm bore and stroke providing a 678cc capacity. Sturmey Archer provided the three-speed gearbox. The year before this one was manufactured, JW Shaw rode a Zenith to tenth place in the Junior TT so they didn’t produce slow machines. This one had come all the way from Suffolk to take part and a fine addition it was too. As BSA has had a mention we better show the other two of the Great British Triumverate – a 1940 Norton 16H and a 1939 Triumph Tiger. The latter is Edward Turner’s supersports twin which followed rapidly after the introduction of the Speed Twin in 1937/38. The Tiger differed visually with its distinctive silver sheen and chrome-plate – and inside the engine had been given a bit of a boost with high-comp pistons and polished ports. The T100 was a top of the range luxury machine when it was new and commands a hefty price tag these days, too. 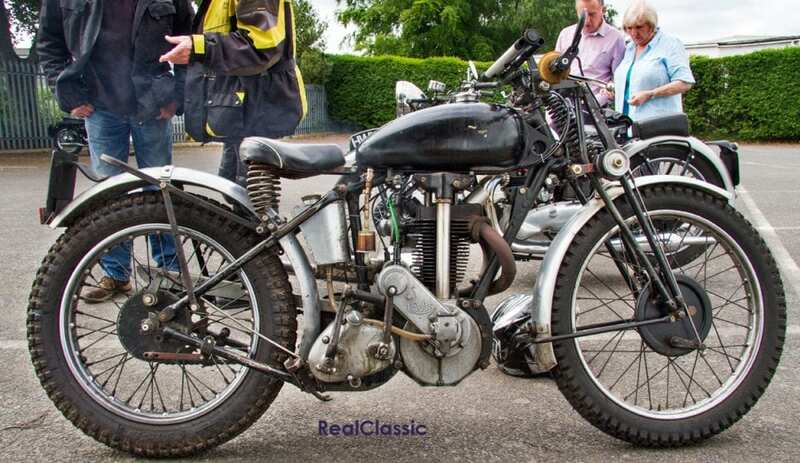 The Norton, by contrast, was a humble sidevalve slogger which gave stalwart service during WW2. It used a 490cc long-stroke cast-iron motor which chugged steadily along at 4.9:1 compression. Top speed was modest, but the 16H could achieve prodigious fuel economy. The 16H stayed in production until 1954, gaining telescopic Roadholder forks in 1947 although it kept its rigid frame which worked well with sidecar outfits. 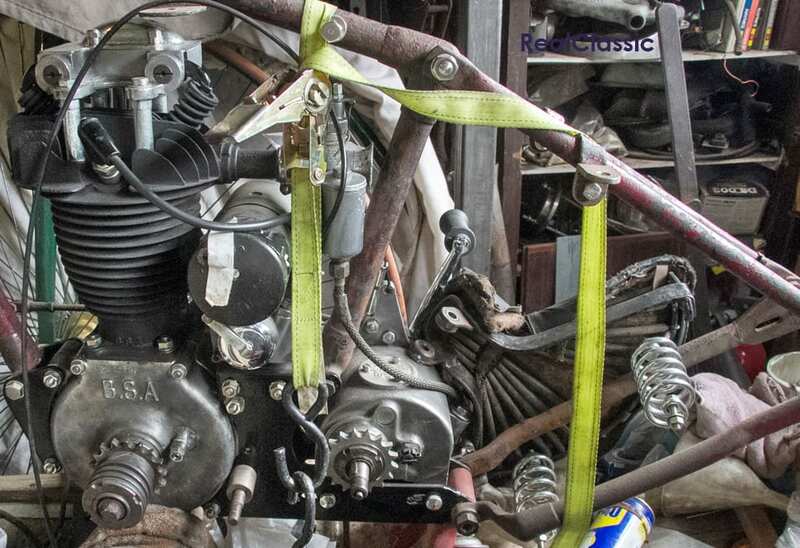 The Super Meteor would have set you back £283.16.1 when new and benefitted from increased horsepower (up to 40bhp), enlarged inlet valves, a new crankshaft and the oil pump speed increased: this example seems to have had some additional oil cooling fitted. 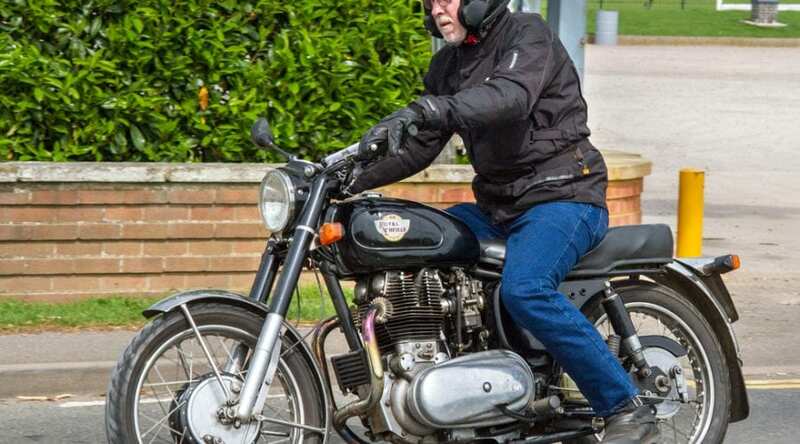 All this led to Royal Enfield having a ton-up machine – Motor Cycling managed 101mph on a Super Meteor; their main criticism being that the main and sidestands left a lot to be desired. There were several Sunbeams on the run but I’ve included this one as it was the only outfit and it’s a special. That 750cc JAP V-twin made short work of hauling that sidecar and it looks pretty good in the Sunbeam architecture too. That is (was) a 700 Super Meteor. Ridden by Steve Goodman. The engine has been much improved with squish heads, balanced everything, twin Delortos, crank triggered electronic ignition. The front brake is two 8″ Norton brakes back to back on a custom cast centre hub. It goes (and stops) like stink and still looks “of the period”. His Enfield singles are similarly engineered for their tasks as 425 competition trials, 625 sidecar tug, 500 road burner and 350 green laner. My ’53 trials bullet has benefited from the Goodman blue printing to make a smooth flexible competition machine.